Mom & Dad were here for a wonderful visit, but left just a day before some excitement at the Villa! First, I need to back up and tell you about when I first went to look at Miss Molly, almost nine years ago. Her “foster father” came to the door and before he even let me in the house, asked, “You don’t want a dog for protection, do you?” No, I assured him, just companionship. He let me in, and I fell in love with this little mutt, who we now know is actually half dog/half chicken. The bedroom door was open and I saw it fly into the living room. I closed the bedroom door, and went into the kitchen to prop open the back door. 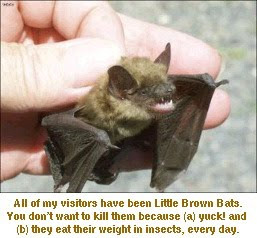 Supposedly, bats don’t want to be indoors, and if you open a door or window, they will find the fresh air and get out. I sat in the living room for half an hour, watching this stupid bat fly back and forth, back and forth. I knew I was destined to fall back asleep soon, so I closed the door, opened a living room window about 6″ (it was about 15º outside!) and went back to bed, closing the door tightly behind me. I haven’t seen the bat since, and I hope he found his way outside. I’ll find out soon enough if he didn’t.